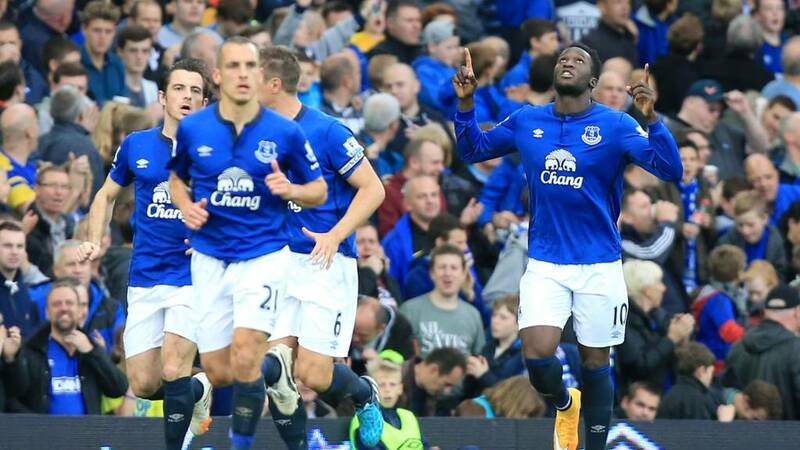 Everton clinically brushed aside sloppy Aston Villa to record their first home league win of the season. Goals from Phil Jagielka, Romelu Lukaku and Seamus Coleman moved Everton away from the relegation zone and condemned Villa to a fourth successive defeat. With Ross Barkley starting for the first time this season, Everton dominated for large periods and consistently found space down the flanks through full-backs Coleman and Leighton Baines. It was from Baines' cross that Jagielka headed in at the far post to give the hosts a deserved lead, the only Everton goal that did not come as a result of a Villa error. One up at the break, the hosts doubled their advantage when Lukaku powered into the Villa box and squirmed a shot under visiting goalkeeper Brad Guzan, who should have done better. And, when Everton won a free-kick on the left, Villa were punished for a lack of concentration. Baines was freed into space, crossing for the arriving Coleman to complete the victory. Villa may point to the absence of the injured Fabian Delph, but an attack boosted by Christian Benteke's first start since March rarely threatened a defence that began the day as the worst in the top flight. An Alan Hutton strike from distance was the closest Villa came and Paul Lambert's side slip to 12th in the table, one point above 13th-placed Everton. The final whistle. All in all, that's pretty routine for Everton, who win at home for the first time this season. They climb to 13th for the time being while Villa, who have lost four in a row, are down to 12th. It's only just come to my attention that Samuel Eto'o wears the number five on his back. Why? He's on for Steven Naismith. Three minutes added on. Everton are swatting away a Villa attempt at an attack. Alan Hutton busts a gut to beat the ball to the byeline, but Phil Jagielka, the big bully, is there to head the ball away. From the resulting corner, Ciaran Clark heads wide. Joe Cole, by the way, is on for his first Premier League appearance for Villa. Other than that, nothing to see here. Villa are toast, Everton coasting. It's not hard to see the difference between these two sides. Villa had had periods of possession and times when they have had Everton under pressure, but they simply have not been as clinical as the hosts. Throw in some poor visiting defending and that amounts to a comfortable Everton win. "Ross Barkley will get plenty off attention today but Seamus Coleman has shown his importance as an attacking asset. He has just scored his third goal of the season and as with Barkley, Everton are a much better team with Coleman in it." Looking again, it seems that Alan Hutton gave away the free-kick, then gave the ball to Everton to take it quickly. It was Hutton who was out of position to provide the space from Baines. Far, far too easy for Everton. Aston Villa have gone to sleep, caught out from a free-kick and punished by Seamus Coleman. The ball is rolled to Leighton Baines, who has so much space on the left to skid the ball into the Villa box. It passes three defenders, with Coleman steaming in at the back post to seal Everton's first home win of the season. More work for Howard to do, this time punching away a cross aimed at Gabriel Agbonlahor. Everton riding this mini-Villa storm, with little more than a quarter of an hour to go. The crowd, finally, seems to be warmed up. Aly Cissokho leads a Villa charge and is cut down by Steven Naismith, who goes in the book. Some lip-reading suggests Naismith uses a naughty word. Surely that should be clamped down on? Villa free-kick, Tim Howard and his magnificent beard arrange the wall, with the Everton keeper collecting the tame set-piece. The home crowd finally coming alive as raging bull Romelu Lukaku batters into the Villa defence. When's he's finally shoved over, the award of the free-kick brings one of the biggest cheers of the day. "Deserved standing ovation for Everton's Ross Barkley as he goes off after 65 minutes. He makes crucial differences to this Everton team - and good news for England manager Roy Hodgson too." Cameras pick up the sight of Rangy Lerner, the Villa owner making a rare appearance. He has the look of a downtrodden old comedian, down on his luck. Like Larry David in Curb Your Enthusiasm. The end of Ross Barkley's afternoon, a standing ovation afforded as he exits his first appearance of the season. Steve Pienaar is on. Hard to see this game coming to life again. Villa finally get hold of the ball and look for joy down the right, with some luck getting it trough a crowd of blue shirts. When the ball runs out Charles N'Zogbia is replaced by Andreas Wiemann. Yep, I'd forgotten that N'Zogbia was playing too. The game is just starting to open up, with more noise coming from the home fans as Everton stroke the ball around. Villa chase shadows as Leon Osman fires a shot straight at Brad Guzan. The sunshine is gone. The clocks go back next week. Sigh. You know how we said Everton would be only a point behind Villa? As it stands, they would be only one worse off than Arsenal and Liverpool, while Man Utd and Spurs would only be two ahead. Everton, remember, started the day in 17th. What little venom there was in this game has been sucked away by the second goal. Villa did actually the start the second half well, and see Christian Benteke hit the bar with a header, only for the whistle to go for a push. Without labouring the point, replays do Brad Guzan no favours. As the ball wriggled away from him, he could only spin around to see it spin over the line, the horrified look of a man who has just dropped his keys down a grid. It all happens in slow motion, like dropping the milk bottle and watching it smash on the floor. "Lots of chat before this game about Everton's £28m record buy Romelu Lukaku's early season struggles. Lack of match sharpness after the World Cup? Lack of confidence? Perhaps a combination. He should be feeling a whole lot better now but there is no doubt Aston Villa keeper Brad Guzan has given him a real helping hand with that. Should have saved." As it stands, Everton are climbing away from the drop zone and would be only a point behind Villa. On the touchline, Villa boss Paul Lambert, no without a tie, has the face of a bulldog chewing a wasp. Still little atmosphere inside Goodison, but that could be because the game feels done. "This was a good time for Everton to get back to winning ways and they have gone about it very well, but Brad Guzan should have stopped Romelu Lukaku's shot. Aston Villa will have seen this game as an opportunity to get something as well, having played so many of the top teams of late." Struggling to get out of their own half? Forget it. Everton have a second and that could be the ball game. Romelu Lukaku finds space down the left of the Villa box, steams ahead and fires a low shot underneath Brad Guzan, who really should do better. The American lets the ball squirm under his body and over the line. Villa press in the early going, Gabby Agbonlahor making a nuisance of himself, only to be snuffed out by Seamus Coleman. Everton struggling to get out of their own half. Second half under way to no fanfare. Villa now right to left as we look on. Villa are back out, serenaded by what sounds like some very dodgy 80s tune. Everton next, mildly applauded by a crowd still without the half-time revellers. Neck the pint and finish the pie. We're ready to go. John Pierce: Nice on the eye from Everton, but yet again Romelu Lukaku is well off the pace. As part of the half-time entertainment, there are some chaps doing what I believe is called 'freestyling' with footballs. One is standing still, with a ball on the back of hic neck. Can't everybody do that? Get the sprinklers on him. In case you're joining us late, a reminder about how the teams are lining up, substitutions and bookings. Tristan Hood: A year ago this game would have been about the battle of the big Belgian strikers but both have been poor so far. Everton fully deserve their first half advantage. Goodison Park is in subdued mood but that may just be because that first half was very comfortable for the home team. That's yer lot for the first period. Everton end it with a corner, cleared at the near post. It's the hosts who lead at the break, deservedly so. Half-time fast approaching, Everton looking to keep the ball and get to the break with their lead. Three minutes added on. The return of Ross Barkley definitely adds an extra dimension to Everton's attacking play. He is a real threat to Villa in and around the area - and manager Roberto Martinez will be hoping his presence eventually brings the best out of Romelu Lukaku, who has been quiet again so far today. Hmmm, in a week that Fabian Delph dislocated his shoulder, Paul Lambert won't want to see Alan Hutton clutching his after an awkward fall. The Scot is up, with the stone-faces of Paul Lambert and Roy Keane watching on. I pity the chewing gum in Keane's mouth. He's teaching that gum a lesson. Almost very, very nice from Everton. Some fancy feet left Leon Osman in the box, with one final turn snuffed out by a Ron Vlaar challenge. All hands on deck for Villa, with Brad Guzan then called into action from a Seamus Coleman shot. Eventually, Villa scrap it clear. After Gabby Agbonlahor goes in the book for a late clip on Leighton Baines, Everton have the chance to gather themselves, keeping the ball in their own half. Measured possession, Seamus Coleman trying to make something happen down the right. Villa organised, not for breaking. It's getting tasty. Gareth Barry and Phil Jagielka have an Alan Hutton sandwich, with James McCarthy then having to get a sliding tackle exactly right in the Everton box. Heating up, mainly thanks to Villa's improvement. Goodison is a little very when Villa go forward, perhaps because Everton have the worst defence in the Premier League this season. The noise increases when Steven Naismith leads an Everton attack that is eventually crowded out, with the same man then earning applause when he is back to defend. Aston Villa just starting to work their way back in here. Manager Paul Lambert has edged his way into the technical area to offer encouragement - no sign of his assistant Roy Keane as yet. He's had a busy week or two. That Hutton chance looks to have given Villa a kick up the proverbial. Sustained possession again ends with the ball at the feet of Hutton, with his delivery from the right almost finding Christian Benteke. Everton clear the resulting corner, all the way back to Brad Guzan. Oooohhhh, Alan Hutton very close to putting Villa level. The right-back, cutting in from the corner of the Everton area, shoots left-footed, with the ball beating the dive of Tim Howard and the post. That's the closest Villa have come. Villa are being forced in to a change, an injury to Nathan Baker calling Ciaran Clark into action. Not too sure what has forced Baker off, but he has to be supported as he hobbles from the pitch. Replays of the goal show just how good the work done by Leighton Baines was. On the right to take the original corner, the England man was running back towards his own goal, turned to beat the defender and, with half a yard of space, fizzed the ball in. Flying past three defenders and curling away from Brad Guzan, it was met by Jagielka's bullet header. How do Villa respond to going behind? If counter-attacking was previously the order of the day, that might no longer cut the mustard. They keep the ball well, earning their first corner. Despite Everton leading, Goodison isn't bouncing yet. Deadlock broken, Everton getting the goal their start deserves. Still up from a second consecutive corner, Phil Jagielka is at the back post to get on the end of a wicked Leighton Baines cross, delivered with the right foot. Did you know Baines had a right foot? Against the run of play, this is not. "Ross Barkley has settled back in quickly on his first start of the season with some nice touches and a couple of surging runs. He was also tested out by one or two heavy challenges. Goodison Park was anxious as Barkley hobbled for a while but he is up and running again now." Singing from the home fans, that shadow that covers Brad Guzan's goal creeps further along the Villa half. Tim Howard, in the Everton goal, is sunbathing. On the Villa bench, Roy Keane looks scary. From distance, Tom Cleverley finds Howard's bread basket. Better from Villa, a Tom Cleverley cross just evading Christian Benteke. Benteke holds up his thumb and index finger to indicate it was just over his head. Villa getting back in it. Blue is swarming all over white in the Merseyside sun. Villa are being forced to defend in their penalty area, feeding on the scraps of a break. For the first time the visitors foray into the Everton box, but the hosts are solid. The free-kick hits the wall, but Everton are causing Villa all sorts of problems. This time it's route one, with Leighton Baines almost setting Romelu Lukaku free. Villa under the pump. Eeesssh, Kieran Richardson dives in on the returning Ross Barkley, cutting the England man down. Everton free-kick on the edge of the box, Richardson in the book. The first chance of the game, good work down the Everton left opening up the Villa defence. Leighton Baines centred the ball, with Leon Osman seeing his shot blocked by the lunge of Ron Vlaar. When it broke to the edge of the box, Ross Barkley belted over. Lovely day on Merseyside, most of the carpet illuminated by sunshine, with shadow just covering Brad Guzan's area. Everton apply the early pressure. We're off, the 100th time Everton have hosted Aston Villa. The first time that landmark has been reached in English football. Villa, by the way, are in their change strip of white shirts, with Everton in their usual blue. The hosts will be right to left as we look on. The managers shake hands, Paul Lambert in need of a shave. He uses his thumb to point back down the tunnel. I bet they've just arranged a post-match drink. "Everton have been poor overall this season. Apart from their win against West Brom they have not played anywhere near their standard. Christian Benteke is back in today and Aston Villa have real pace going forward. With Phil Jagielka and Antolin Alcaraz at the back it could be difficult for Everton." Music plays, the players emerge from the tunnel, fans stand to applaud. For Villa, this is part five of a consecutive run against last season's Premier League top five. Obligatory handshakes, sprint to the respective halves. Hugs and kisses. Villa confirmed England midfielder Fabian Delph's two-month absence on Friday. Delph injured his shoulder on Tuesday but it has since been confirmed that he requires surgery. Paul Lambert is at least boosted by the return of Christian Benteke, the striker that has been out for seven months. "I said at the time that the international break would come at a good time for him," the Villa manager said. "That gave him another couple of weeks to train with the team, and we had a [behind-closed-doors] game against Leicester that he scored in so that gave him a lift as well." Lovely sunshine at Goodison, the players warming-up as the sprinklers dampen the playing surface. Nothing unusual there, until you look a little more closely. At one end, two girls, presumably mascots, are wearing blue dresses and bonnets, as if they were here for the first meeting between these sides in 1888. Is that normal? They are belting a ball into an empty net. Everton: Howard, Coleman, Baines, Jagielka, Alcaraz, Barry, McCarthy, Barkley, Naismith, Osman, Lukaku. Subs: Robles, Hibbert, Gibson, Eto'o, McGeady, Besic, Pienaar. Aston Villa: Guzan, Hutton, Vlaar, Baker, Cissokho, N'Zogbia, Cleverley, Westwood, Richardson, Agbonlahor, Benteke. Subs: Clark, Weimann, Cole, Bent, Sanchez, Given, Lowton. Statistical omens aside, both Martinez and Lambert have reasons to be cheerful with the teams they have picked. For Everton, Ross Barkley starts to make his first appearance of the season after suffering a knee injury in the summer. Villa, meanwhile, have Christian Benteke in the starting XI for the first time since Belgian striker ruptured his Achilles tendon in March. Villa, though, are without Fabian Delph for two months after the midfielder suffered a dislocated shoulder. Actually, Everton might be quite pleased to see Villa. For a side beginning the day in 17th place, only two points above the relegation zone, the visit of opponents that have not won at Goodison Park since 2006 might be something of a boost. Villa boss Paul Lambert won't be too pleased to have Roberto Martinez in the opposite dugout either. In six previous matches, Lambert has failed to get the better of Martinez. If familiarity really does breed contempt, then these clubs of Merseyside and Birmingham mustn't like each other very much. The most-played game in English football is on the fixture list for the 199th time today. Tasty. See, for all the grumbling we do about the money in the game, the behaviour of the players, the awfulness of the referees and the lack of spending from the chairman, we love it, don't we? On the subject of moaning, maybe it's that familiarity brings contempt. Which brings me to Everton and Aston Villa. Not too many people know this, but there's an internal magazine distributed amongst the staff of the BBC, which includes a section called 'overheard in the office'. Overhead in this office today was the statement: "The Premier League just shows how rubbish the international break is." Yearn no longer, because it is back. Hello, old friend.